Will We Ever Stop Using Rockets to Get to Space? 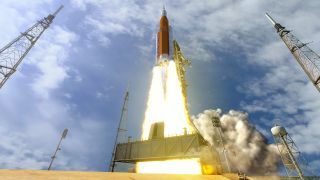 Artist's illustration of NASA's Orion spacecraft launching aboard its Space Launch System rocket. Orion will loop around the moon for the first time during Exploration Mission-1, currently targeted for the end of 2019. On March 16, 1926 in Auburn, Massachusetts, American engineer Robert Goddard launched the first liquid-fueled rocket. The flight lasted a mere 2.5 seconds and ended anticlimactically 181 feet away in a snow-covered cabbage field, but it would prove to be one of the most significant flights in history. Ninety-two years later, liquid-fueled rockets are the norm for spaceflight. Towering, explosive behemoths standing sixty times taller than Goddard's original rocket blast humans beyond the boundaries of Earth's atmosphere. Each launch is a true spectacle, offering testament again and again to humankind's collective potential to transcend barriers and reach new heights through brains and cooperation. But will rockets remain our primary transportation to space into the far flung future? Or will they eventually be replaced by new methods and technologies? Rockets, after all, are far from perfect. Seven astronauts have died during launches. By chemical engineer Don Pettit's calculation, "sitting on top of a rocket is more dangerous than sitting on a bottle of gasoline!" He ought to know, he's done it a few times. Pettit has flown five missions to the International Space Station and has tallied 369 days, 16 hours, and 41 minutes in space. At age 62, he's NASA's oldest active astronaut. High costs are also an unfortunate drawback of rocket launches. Since roughly 85 percent of a rocket's mass must be taken up by propellant, there's little room left for cargo. That makes booking a ticket to space exceedingly expensive – around $10,000 per kilogram to reach low-Earth orbit. For a long time, rockets have also been inherently wasteful, their parts simply falling back to Earth, burning up on re-entry through the atmosphere, or joining the space junkyard currently orbiting our planet. These problems have prompted some to speculate on replacements to rocket launches. One of the most futuristic and far-fetched is the space elevator. It's a favorite of sci-fi fans for a reason: it almost certainly will remain in the realm of fiction for a long, long time. A space elevator is simple enough on paper – extend a 22,000 mile set of cables from a space station in geostationary orbit to a corresponding structure somewhere at Earth's equator. Affixed cars will then climb the taut cables all the way into space. The problem, however, is that the cable system must be constructed from a material far stronger than anything known. Carbon nanotubes have been hypothesized to fill this niche, but they aren't ready yet. Perhaps one day, they will be. A space elevator car could potentially take passengers and cargo to space in roughly a week at a cost seven times cheaper than SpaceX's Falcon Heavy rocket, the most economical rocket available. Magnetically-levitated spacecraft will be propelled inside a curved tube aimed skyward. All air will be evacuated from the tube in order to eliminate drag. Craft will exit the lengthy tube at a speed of 8.8 kilometers per second in order to escape Earth's atmosphere. A generation-1 StarTram design intended to launch cargo vessels will feature a 81-mile tube built up the side of a mountain to reach a launch altitude of 12,000 to 20,000 feet. The beautiful thing about StarTram is that it's surprisingly feasible. All the required tech exists today; it just needs to be scaled up big time. That makes building StarTram a matter of time and money rather than a flight of fancy. Is StarTram's $20 to $50 billion price tag worth it? Possibly. It could reduce cargo costs to space to just $20 to $50 per kilogram, potentially unlocking trillions of dollars worth of new industries. Another idea, courtesy of JP Aerospace, eschews fiery rockets for giant airships that gently ascend all the way to space. A massive V-shaped "Ascender" aircraft would ferry cargo and passengers to the permanently floating "Dark Sky Station" at 140,000 feet. From there, an "Orbital Ascender" airship powered by ion engines would complete the journey to space. JP Aerospace's original funding came from the Air Force, and they're still highlighting progress on their blog. So could any of these ideas supplant rockets? JP Aerospace's airships probably have the best chance to make a challenge in the near term, but it likely won't amount to much as the private rocket industry is growing rapidly, creating competition that spurs innovation. Cargo costs are dropping as companies refine propellants and reduce material costs. SpaceX recently changed the game by creating reusable rockets that land intact back on Earth after launching their payload. The company's new Falcon Heavy launches cargo at an "absurdly low-cost" price of $1,411 per kilogram, undercutting competitors by thousands of dollars. In the coming decades, prices will likely fall even further. Rockets will almost certainly be around much longer. In fact, they may just be taking off. Editor's note: This story has been updated to correct the number of astronauts who have been killed during the launch phase of a mission. The number is seven, not 14.